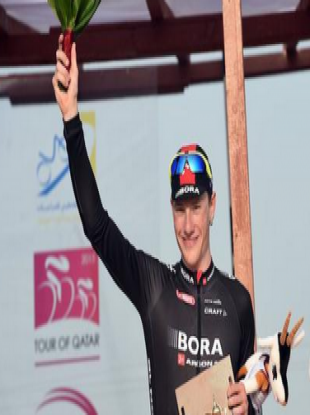 SAM BENNETT CLAIMED the biggest win of his career this afternoon as he held off the challenge of a top field, including Peter Sagan, to win the final stage of the Tour of Qatar. In a dramatic finish on Doha’s Corniche, Bennett, who rides for the Bora-Argon 18 team, timed his counter to perfection as he waited until the final 200 metres until making a move past Italy’s Andrea Guadrini. It is the 24-year-old’s first win of the season as he finished in a time of 02:23.03 to finish in 79th place overall. “I’m absolutely delighted with the win,” he said after the race. Email “An Irishman held off some of the finest sprinters to win the final stage of the Tour of Qatar today”. Feedback on “An Irishman held off some of the finest sprinters to win the final stage of the Tour of Qatar today”.